1999 was the year! I was only 22 and boy did I party like "It was 1999!" One boat, Forty Sri Lankans, One Sri Lankan band, Three good friends, Two crazy girls, One hot mother and unlimited liquor, December 31, 1999, Long Beach California, somewhere in the middle of the lake where you'd least expect to be hit by Y2K. Ahh the good old days! When we working our butts off, sometimes 48hrs+ straight, on a novel project called Menus.com. Those were exciting times, when an idea can easily end up being turned into a dot com site, billboard everywhere displaying some new dot com name, which ultimately ended with the dot com crash back in 2000. 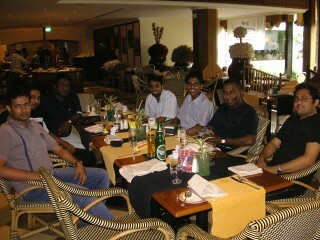 Keith is in town and I was invited with a couple of other old friends to Hilton Colombo for lunch. I got a bit late getting there after the Python group presentation, but made it just in time to start lunch. It was nice seeing Keith, who I thought had got slightly thinner, and Manik (daughter) who looked pretty much the same except for the height and Migari (wife) who was busy attending a cookery demonstration and just popped in for a minute or two. Indika, Aruna and Bartee were the old friends I worked with then (well actually Indika I worked with again recently) and Buddhike (yes similar to my name but ends with an e) and another guy(sorry I forgot) are new to me and are still working for Paragon, Keith's company. The solution... welcome to "Work from home". Ok this isn't really a solution that I've even mentioned to my boss, but its something I've been doing the last 2 days. I went to office late while I worked on the project from home. I found that I was really able to do a lot of work, since I was planning to go and show some progress in the evening. I got up at around 7AM and first started working on my openOffice presentation (notice I didn't use the word powerpoint!) on "Python vs Other Programming languages" taking Java as an example. This a group presentation due some time tomorrow. I worked on that till about 9:30 and then after having breakfast got down to some office work. These days I'm working on a perl based front-end for configuring a linux firewall. I managed to get a fair amount of work done till about 1:30PM. So overall its been a satisfying day except for may be one or two small incidents ;) Hopefully things will get better when our development room is built. Anyway no time to think about that since tomorrow my presentation is due and I still have a few things more to prepare. I'm also hoping to meet Keith tomorrow for lunch so more on that tomorrow. set the meeting at 11:00, we made it just in time. working on but hey what can I say.. my brain was way underclocked! Oh! its Tuesday already.. time to shut up! Today was an interesting day for me, as I was very much looking forward to joining with the LKLUG crew, to go and convince ICTA effort headed by Riza, that Linux was the way to go for their 100,000 Home PC initiative. Though nothing is official at this point, ICTA is planning to offer 100,000 personal desktops at a very reasonable price to Sri Lankan families in an effort to increase computer literacy among the population. It is rumored that after approaching Microsoft , and seeing their lack of enthusiasm to provide a cost effective and attractive price solution for Windows/MS Office suite, ICTA had decided to go with OpenOffice as the Office Suite and possibly Linux as the Operating System (OS). It is also rumored that once news got out of the possibility of going with OpenSource, Microsoft had decided to cut prices and reapproach ICTA. If these rumors are true, then it is really a good fortune that ICTA, despite the influence from one of THE biggest software giants (a.k.a monopolist) , is going ahead and giving OpenSource a fair try. The meeting was scheduled at 4:00 but for some reason some of us got the feeling it was at 4:30, probably due to an earlier post on the LKLUG mailing list that other LKLUgers were planning to meet at the Narada Center at 4:00 and leave from there. Channa (CEO of itabs or should I say my BOSS) had also been invited, so I was planning to tag along with him. Anuradha , said he would also like to tag along with us and would come to our office by 4:00. Anyway although Anuradha managed to find our new office and get their at about 4:10, Channa had got a call from ICTA asking why we were not there! Oh well! due to the misunderstanding now we are late as usual :) It was good that ICTA was close by (Kirimandala Mawatha) and so we managed to get there before 4:30. The discussion was quite positive, and I suppose an eye opener for them as well. The biggest question on their minds was the support issue. If something goes wrong, how can the average home user get support to solve the problem. What they initially failed to realize, but ultimately came around to, was the fact that even with Windows support wasn't all that great. For one thing even if you legally bought windows, currently Mirosoft in Sri Lanka, doesn't provide good support and calling Singapore (for some support) is expensive. Then the unofficial support you tend to get from your local computer dealer or your smart friend, usually involves reinstalling software, cleaning viruses or in most cases reinstalling the whole Windows OS. Nevertheless due to the amount of Windows penetration, currently the chances of finding someone with some knowledge to help is better than that for Linux. On the otherhand you wont have a good linux support from the general public without a good linux penetration, which requires an acceptable level of support to begin with - this is a vicious cycle that we must really break out of! ITABS and a couple of other companies are interested in the possibility of providing some sort of Linux Support to Home users by extending their current Corporate Support. But the exact nature of support (phone, email, on site) is yet to be decided. Another pressing question that kept cropping up during past discussions on the list, which eventually leads to a lot of debate is "What Linux distro should we go with?". This is a question that leads to a common argument among linux enthusiasts and is often labeled - "Distro WARS". Its a fact that most of us in the opensource community has learned to live/avoid with since unlike in the proprietary world where there are only one or two choices, with opensource there are a lot of choices. Like there are a lot of political parties, religions, or ethic groups which we generally consider a_good_thing, sometimes they also cause tension when it comes to the discussion which is better - since better is just a relative term. Anyway it was really good that all of us at LKLUG had met prior to the meeting and had decided to support Mandrake Linux for its easy of installation, configuration and use. After describing the advantages of Mandrake Linux over Windows and then over Redhat/Fedora (other popular versions of Linux) and why its a good option to start with, most of the ICTA people were very curious to learn more and for a demonstration. So that's where we strand at the end of the today. We have a demonstration scheduled for tomorrow morning at ICTA, where we will show that installing Mandrake Linux is faster and easier than installing Windows XP! Things are looking good at the moment. We are positive if things pick up, then we can even work on a sinhala version of Mandrake Linux in a very short period, as most of the work has already been done (sinhala.linux.lk). Anyway I was too excited about tomorrow's demonstration that I ended up going to Narada Center and installing Mandrake 10.1 Community edition on my Bare Bone System :D Actually I took it to office today, hoping to install gentoo, but have a bit more work to do on that since its a stage2 installation that I am performing, which requires most of the packages to be compiled from source code. The Mandrake installation was smooth (as opposed to installing Windows on a SATA hard drive -- a pain! ), and everything pretty much worked out of the box. I did run in to small configuration issue after upgrading to the proprietary NVdia drivers, but managed to get that sorted out under half an hour. Things are looking good for tomorrow and I am hoping to also take my Bare Bone System, just to show off :P Check back tomorrow to see what happened! Today was one of those 24 (TV series) days -- started out one way, ended in a totally different way. To begin with, today was my last MSc first semester paper on cryptography. This was a paper I was more confident of, and was hoping to bump up my overall averages. So I guess you'd understand why I didn't feel like driving back home from the junction after discovering I had left my cell phone behind. Now don't call me superstitious , but I just didn't want to take the chance of having to go back! .. Its BAD LUCK! But not having the cell, did bother me through out the day, specially when trying to communicate with my better half. As expected the exam was quite easy and most of us couldn't complain. After the exam Deep had organized to take a few of us out to celebrate his new found fortune (aka new job), so we headed over to millennium Park to find a couple of more MSc Friends had also independently shown up. NO problem, deep was paying, so the more the merrier! We were pleasantly supprised to find Mill Park happening, with a big young crowd promoting AIDS (prevention of it I think ;P) We got a table and some drinks (soft :), when I got an SMS (to a friends phone) from my g/f saying she was on the way to Campus with lunch. So I rush over back to Uni, and had lunch with her and headed back to Mill Park to find everyone missing from their seats! For a second I thought that they were playing some sort of prank, since I saw Lakmal's car parked, so I know no one left. Thats when the fun really began! I found the guys getting ready to go to a laser Tag like shooting game (not a video game, the real thing..except no one gets hurt). We put on these cool jackets that came with a laser gun attached to it. The arena had several walls to hide and shoot your opponent. The whole exercise was fun and tiring at the same time with all the running around. But I was disappointed when I found at the end I hadn't shot anyone!... Not a single soul! I was hit about 5 times of which I think the last 3 happened when I gave up -- was too tired. Its only later when I got home I noticed that the gun hadn't fired at all, and when I come to think of it my gun didn't emit any laser beam. Damn! I had been cheated! But everyone was a bit suppressed when the winner of our tournament turned out to be Lochana. After having desert (I already had had lunch), I had to rush back to Uni to take a Linux class at UCSC. That was also quite interesting since it was a new batch and they were quite interactive. With a few foreign students, who weren't really shy to ask questions, it really paved the way for everyone to start talking. Most were Windows administrators/users and some developers looking to learn this new wonderful OS. The rest of the evening was filled very intellectual conversation with my better half. So there you have it! A very rare and diverse day of my humble life (most of the time). It's been a while since I started walking a bit more than usual. Back in the days before I had a car, walking was something I did more often since I hated going riding buses (specially when they are full). Anyway today I decided to service my car after a really long time. May be it was that last washout incident with the whole rain thing (see my previous post), that strengthened my bonding with the car, for I had neglected it far too long. Even cars need love :) Specially when they've gotten you home safely under tough conditions! So I went early as possible to the service station, hoping to catch an early time slot, but I guess people had already booked so I was either going to have to wait hours and hours or be more productive. My plan was to study anyway for the next exam (Cryptography) on Sunday, but I also had few things to do. So I set on my journey by foot. If things couldn't get any worse, while driving I noticed a small trail of vehicles slowly moving with plenty of room for overtaking. So I slowly passed them and moved a couple of meters, to discover to my horror that most of the road had flooded upto knee length! I had gone too far ahead to turn back -- a couple of vehicles had decided to follow me :O So I slowly marched forward as I felt the water splash against the bottom of my car. SPHhhhhhhhhh! and there it was! a lot of while, grayish smoke escaping out of the hood of my car. There was also another diesel van in front of me, also smoking out some heavy fumes, which just made my view all smoky. The engine seemed to give a tad of a miss, so I moved a couple of meters forward and pulled over, then turned on my hazard lights. For a minute, my kernel had just packed up, as I watched in horror at the sheer number of people who were lifting up their sarong or rolling up their pants and one or two tree-wheelers being pushed by their driver and a couple of more vehicles with their hazard lights on. Next I popped opened the hood, and went out into the cruel rain to inspect my engine. The engine seemed fine, except for being extremely hot since it was evaporating just about every rain drop that touched it. I hadn't brought an umbrella (hence it rained ; Murphy's law :)), so was socking wet as I got back in.The engine temperature also looked fine so I thought I'd start and slowly move forward. Slowly I managed to get to relatively dry ground and was soon home. That was a close call! and though this incident may seem isolated, its really not. Every time it rains hard for a couple of hours straight, the streets of Colombo and its suburbs are designed to flood! From time to time you hear politicians/authorities promising to fix the problem, to introduce proper drainages, places to dump garbage etc., but I guess those promises also get washed away during the flood. That's "Tax Payer's money at work" for you! Throwing away plastic and polythine wrappers, without thinking twice by pedestrians and driving vehicles, also aggregate the problem. So we are all to blame!